Facilitator: Who has free land for potential new comers? 6 out of 28 people. Who would like to have it? 5 raise their hand. Who has cash incentives? The majority. In the last 10 years, they have given 500,000$, 2million and one guy said 10 million. Facilitator: They looked at how much money they have given in the last years, and how much they have collected. They have only gave 600,000$, but that they have got 16 million dollars in tax revenues. “A pretty good return of investment”. (later he changed to over 10 million dollars, so I’m not sure about the figure). Most of the incentives (which can be tax abatement or other types of support – it is not always cash), is usually done over 3 years. Some said in 7 years or 10. Usually money is for potential incomers, but sometimes they would give money if a company is planning to leave, and or they have an offer on the table from another place. They all offer workforce training programs. Tax benefits were usually based on investment, but in today’s economy the main thing is jobs. They know big companies receive training to get governments money. They know the lingo, etc. But they know that companies will hardly leave only because of the money. They also know that sometimes they just want attention, not money. “If they call you to complain about traffic, for example, it was advised not to excuse yourself by saying that this is not your department! You have to be the facilitator and help the firms!” (I loved that answer). Lady: How can we promote quality of place? Facilitator: that’s very interesting, but it’s another subject, let’s stay focused. Lady, a little in doubt: But, quality of place is also an incentive to bring companies! We have a great living standard, but we don’t know how to market it. People agreed, this was also important, and the facilitator let them talk a little about it. (they use images with sailboats and kids with tricycles in their pamphlets). Young fellow: We’re trying to focus on certain industries. Facilitator: Yeah, we all are trying to do that. Young fellow: We in Anytown, Colorado, we’re trying green energy, etc. Facilitator: In a very hypothetical case, that the federal government will ban cash incentives. Would you agree? Yes = 8. No=3. Undecided= A few. Facilitator: It would be good, because at the end of the road, we’re fighting against each other (Some nodded) But why would it be bad? Let me ask among the ones who said -no-. Man who raised his hand fastest when answering no: We will lose firms… In this globalized and competitive world, they will leave us. Facilitator: So you’re saying that other countries will out-compete us with financial incentives. Facilitator: Could not they do it now? Facilitator: Many here have not participated. Any of you have any comment? “I’m a phd student, researching on LED, so I’m really happy to be here, because you’re the guys running the real show. My perspective from the academic research is somewhat different. Most research is very skeptical of incentives. Mainly for two reasons, first because as you said, you’re fighting against each other, and second, it’s really difficult to measure the impact of them. I mean sometimes it can be done (pointing with my hand to the facilitator’s example) but it can be very biased”. 3 old guys, including the facilitators, were hard on me. Me: “Just to clarify, I’m talking about cash incentives”. Facilitator (looking at me): “I tell you, we gave so little money, and we have got so much! It really works!! Another guy also was hard on me, I could see his lips moving, but at that point I could not really hear much more nor take notes. Two worlds. I hope you get my point, regardless of what field you come from. One of the most interesting questions was when the facilitator asked who will increase/the same/decrease their cash incentives the short term future. Does the economy grow or shrink? More importantly: Where and for who? Much media reports economists saying, “the economy is going to be good”, or “the economy is going to be bad”. There is of course a relationship of the political agenda of the outlet, to have a line towards more positive or negative. I find that both of the economic predictions are mostly right. Because for some the economy does good, and for others does not really improve. And this is what I find that the media does not report it too much on it. That is: inequality. Similar thing is happening in many places, and the media usually puts together countries, states, provinces (and rarely cities), and they say: “the economy has grown (or decreased 1%)”, but they do not say where and who wins or looses this 1% of the economy. It actually it should not be that hard to introduce some coeficients like the Gini index, or even better some type of Human Development Index. I’ve also heard in the news how Sarkozy, it’s trying to do some alternative socioeconomic indexes, “different than the Anglo-Saxon”. I think it should interesting to look at some of them. I have also noticed that there is an increasing discussion about inequality among bloggers, not corporate outlets but even in some places like The Economist or Vanity Fair. In fact, I have recently tagged with #inequality 10 or 15 articles in my twitter. Comments Off on Does the economy grow or shrink? More importantly: Where and for who? If you have problems wathing the video, just click on his name. I was surprised how young he is. I always pictured him as a 60 yeard old guy. Here it is a podcast of Ed Glaeser in Freakonomics: Why Cities Rock. From February 18. I really liked it. I didn’t like some stuff, but I enjoyed the idea of building up in San Francisco Bay Area. For an image of the future that is guaranteed to chill US civic leaders and bondholders alike, there is no better place to look than among the potholed streets and boarded-up houses that litter the Californian city of Vallejo. It made me feel good that last year I went to the city to make a case study about it. I stated at Univ. of California, Berkeley during the whole Spring semester 2010. 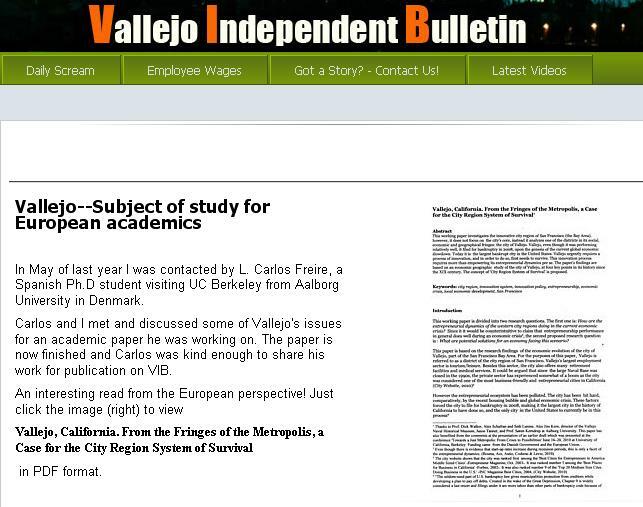 A few days ago I finished writing a paper called “VALLEJO, CALIFORNIA. 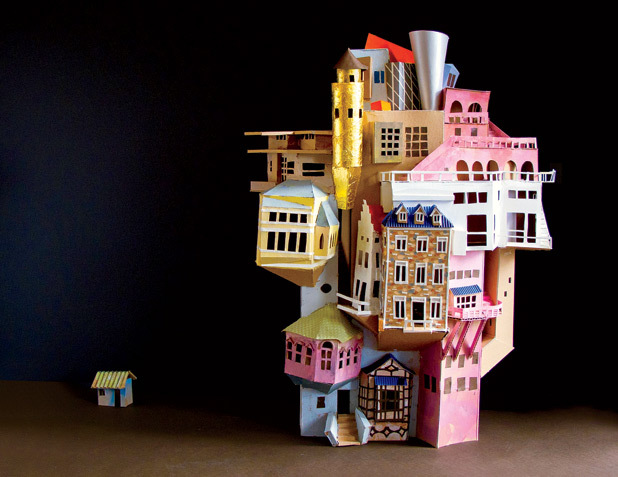 FROM THE FRINGES OF THE CITY, A CASE FOR THE ‘CITY REGION SYSTEM OF SURVIVAL’. I wrote it to present it at the DIME-DRUID ACADEMY Winter Conference 2011, this week. This paper is very heterodox, and is a paper on progress. The main purpose of it was to make a summary of theories I learned about Local Economic Development at the Berkeley libraries. I then tried to connect the case of this city (or district) of the San Francisco Bay Area, and its significance to entrepreneurship and innovation policy. Innovation from a broad sense, for the ones that now what I’m talking about. I got much help from the locals of Vallejo, and one of them, the editor of the popular Vallejo Independent Bulletin, asked me to send him a copy of the article when I would finished it. Keeping my word I sent it to him, and he has published it online. I am grateful he did it, because I got a few comments from the citizens. This made me realize that my ideas are still quite confusing. So I wrote a comment. It seems it has an anti-spam feature, I told the editor. For now I’ll put it here. Since I read the comments of Ab and SomeoneElse on my paper about Vallejo and the Bay Area, I have been thinking a lot. I am grateful for the comments. In particular, because I have realized that I have not made a good job to express my ideas. This is hard, as English is not my native language. But also because of the internal fight I have had. I am a PhD student specializing in local economic development, but it is the case of Vallejo that has made me changed many of my preconceptions. Now I would like to comment on the comments. Ab says: -“the last line is spont on”- and then quotes me: -“Vallejo … end up like many cities in third world countries, where a few (police and firefighters?) live in affluence while the vast majority of citizens live and die in misery”- [police and firefighters added by Ab]. There are two things. First it should be understood that even though Vallejo has been a city, since the 19th century, I refer in the paper as a “district” of the city-region of the Bay Area. I know this may sound weird for any local (of the Bay Area), but coming from abroad I can clearly see that the Bay Area is a large metropolitan area, highly connected in its economic geography. The second thing is that I don’t necessarily say that police and firefighters are the few, or the elite of Vallejo, nor of course the elite of the city-region. True, they are an interest group, and as I referenced in the paper they have a well known “symbiotic relationship” with the political power of the city. But going back to my first point, one has to look beyond the city limits of Vallejo. Making $150,000 as a safety employee it’s certainly high, but what about the bankers and real estate leaders who make 10 times or more, in the different districts of the Bay Area?. This is probably a stupid comparison, but what about the profits of a company of the city region, like Apple making 100,000 times more. But still, what is their responsibility towards their neighbors? “Someone Else” points out we need to think outside the box. I’ll try to do it. There is so much anger against the public safety employees, and probably with a reason. But this is not going to solve the problem of Vallejo. Thinking outside the box… What about a Bay Area police? After all, the criminals operate in all the Bay Area, not only in one particular city. I am NOT an expert in safety, but I see that the New York City Police Department, covers 8 million people, more than the 7 million of the Bay Area. The Bay Area has already the BART police, that would fall inside the Bay Area Police. The 9 counties police departments (sheriffs), a heritage from a bygone era could also be reduced. I repeat, I have no idea about this field. But as an economist I would think that cities (and their tax payers) would avoid the “competition” among them. And that is the idea: work more towards collaboration, than competition. Of course, safety should not be the only thing. In fact should be the least. The most important things would be towards, education. I had the chance to be in UC Berkeley, one of the most amazing universities in the world. Also visited friends in Stanford. Great places. I know all these ideas have been said many times before, even from the former Governor (I still can’t believe people voted for an European actor). But there should be more mechanisms to get more funding for the rest of more ordinary higher education. However, what I think is of really concern, is the high inequality in the school districts across the Bay Area. In Europe we have many problems, don’t get me wrong! but with the exception of a few countries (like UK), every child has the same amount of money allocated for education, regardless in which neighborhood was born. There is an urgent need for a more cohesive education across the Bay Area. More cohesiveness should be as well for access to justice, healthcare, transportation, innovation and entrepreneurship policy, etc in the Bay Area. That’s what I am trying to say in the paper. Because the different parts of the city region are so interdependent. The same goes to having X or Y Mayor. Sure, many question if Davis should be the Mayor. But I think it does not matter if X or Y, or Z would be Mayors. Neither if Vallejo hires the best consultants, or the best City Manager. My hypothesis is that it does not matter who is in the leadership of Vallejo. The city will not survive. Unless, they realize that: 1) Vallejo is dependent of the city-region. (This does not mean surrender). 2) There is need of active coordination, at local (Vallejo) and city-region level. That is stop fighting at local and inter-local level, and start collaborating. If not, and now I clarify, the city region of San Francisco, will become more and more as third world country, “where a few live in affluence while the vast majority of citizens live and die in misery.”. Many in the elite, as the mentioned Andy Grove in the paper, have noticed it. should know that during the twelfth century, Saxo Grammaticus wrote Gesta Danorum, which is an essential source of Danish history; that the story of The Ugly Duckling was written by Hans Christian Andersen; that Jørn Utzon is a Danish architect who designed the Sydney Opera House; that Vilhelm Hammershøi is aDanish painter; that Niels Bohr is a Danish scientist who won a Nobel Prize in Physics; that Denmark won the European Football Championship in 1992; and that Erik Balling is the director of the film The Olsen Gang. Other questions focus on constitutional issues, such as abortion, equality or free speech. I declare that to the best of my abilities I will make active efforts to ensure that I and my children (if any) acquire Danish language skills and integrate into Danish society. I will make active efforts to become self-supporting through gainful employment. I will make active efforts to learn the Danish language. I will make active efforts to acquire an understanding of the fundamental norms and values of Danish society. I will make active efforts to participate in the life of the community.I will participate actively in any introductory programme I am offered. I will make active efforts to facilitate the integration of my children by working with day-care centres, schools, etc. to ensure that they acquire Danish language skills as early as possible. I am aware that in Denmark principles apply such as the need for respect and for equal opportunities for girls and boys to develop; that adults are obliged to listen to their children; and that corporal punishment is prohibited. Danish immigration policies are among the strictest in Europe and have been criticized by the Council of Europe and the United Nations. Recently, a decision of the European Court of Justice (ECJ) that restricts Member States’ power to regulate migration—and implies that the Danish policies are incompatible with EU rules—has brought to the forefront the relationship between Member States and EU institutions over matters of immigration regulation. In that case, the ECJ reviewed whether a restrictive Irish law, stipulating that foreign spouses of EU citizens must have lawfully resided in another EU state before being granted admission to Ireland, is in line with the EU Directive on Family Reunification.160 In an important precedent, the ECJ recognized the authority of Member States to regulate terms for entry and residence of non-EU family members, but noted that these terms may be based only on “grounds of public policy, public security or public health.” The ECJ dismissed other grounds, such as economic need and culture. It ruled that EU citizens have a protected right to freedom of movement within the EU, which includes the right to reside freely in another Member State with non-EU family members who accompany them. In addition, the ECJ has called upon Member States to review their legislation to ensure that it is in line with the EU law. According to opinion polls, fifty-five percent of the Danes disagree with the EU’s intervention in Danish immigration law, seeing it as “robbing our national statehood.” The DPP leader stated that “the Government must tell the EU system that it was a prerequisite for Danish EU membership to be able to run our migration policies independently; it is [the] Folketinget [Danish Parliament] that decides—not ECJ judges.” To date*, the Danish policies are still in force. * My friend Bram, just pointed out that, actually yesterday the rule got tighter. I guess that’s why I received so many visits on the blog. Now, it’s not only that your spouse has to be over 24, it also needs some points. Even though, a “23-year-old American nurse, who already speaks some Danish, should find it easier to move to Denmark with her spouse” (According to the Government outlet CPH Post). I wonder how is she going to speak Danish living in the USA, because a CD language course I assure you it does NOT work :) According to Information, the main idea is to stop Muslim immigration. Mobility is an important factor in the cities. In my home country Spain, there is a big debate about the use of bikes, and its promotion and problems. See for example the brad new blog in Spanish. I ♥ Bicis (bikes). Here in Denmark, I love biking to work everyday, ok I admit it, not with intense rain or snow. What comes before the biker or a biking friendly infrastructure? One would say the biker. However, a correct planning it’s crucial. Here I show a video of the evolution of the cities of the Netherlands. I think in Spain the most important thing that would change the whole mentality is to incentive housing property owners to have a bike parking. For example, in Denmark every building by law has to have a bike parking. I hope in the future some Spanish cities would change their mentality, some of them are taking good steps, but overall still the bike use is minimal. For now, we should keep asking, what comes first, the car or the car friendly infrastructure? Thanks to Manuel Fernandez for the link, check his web Ateneo Naider. – A Study of Rural and Urban Populations in Denmark”. It is coauthored with Kristian Nielsen, a great economist from the Business Department. He’s like me, a PhD candidate, but he has many more skills, including the crucial econometric and statistical analysis. We have done a paper based on a survey conducted to more than 2000 people, of which 3/4 were successful entrepreneurs and the other 1/4 were employees. Today there is a huge debate about the importance of living in the city vs. living in the country and its influence in entrepreneurship. We wanted to see if they had any difference in their networks, identity and start-up motivation. More or less the question we rise is: Where do you have more differences: between the urban and rural population, or the entrepreneurs and employees (regardless of geography)?. We have asked this in two conferences we have presented the paper the DRUID and the AAG, and answers are split. What do you think? At the end of the paper, we wrote a fictional story, but based on true research! to summarize our findings. Here I share with you the story, which probably will not be in the paper for space and copyright reasons. The paper? Soon in your best journal :) If you want to give us some feedback (before we send it to the journal!) we could send it to you, I guess. To illustrate some of our main findings regarding entrepreneurs we will present a simple example. – Imagine you have two friends, Ruben and Urban. Ruben is from a rural area, and Urban is from a big city. You talk with each one of them once in a while. You are an equally important friend for each one of them, since they have around the same number of friends. Ruben, earned a three-year technical degree and Urban got a university degree. When you hang out with Urban and his friends you talk about ideas for businesses. He is a very creative guy. – Some time passes – Urban is about to get married, and Ruben, although slightly younger, already has. Interestingly, they both started a business in the service sector. Urban proposed that you and another friend join him in his business adventure. You did not join. Urban borrowed some money from family and friends. – A few more years pass, and both of your friends have become successful entrepreneurs – By reading the results of this paper, you know that you are equally as likely to receive a call from either of them to have a drink. But you are more likely to have Urban ask you for help, with for instance, a computer problem. If you do not help him, you should not worry a lot; he’s the type of person who will soon call an IT professional or another friend. It’s not that Ruben won’t have a problem with the computer, but he would not bother you about it. Ruben would probably ended up spending a few days fixing it himself. This was a didactic example based on some of our results, overemphasizing the main differences. The differences between age, marriage, and education of these characters can probably be explained by socio-economic and cultural values for each region. Whether this is true for the difference in personal traits and work values could be important to further investigate. Also, the reason for the different use of networks is unclear, however, this behavior is probably related to geographical proximity and/or agglomeration issues. It seems that, while much has changed over the last centuries, in today’s economy the rural entrepreneurs still share a certain resemblance to the rural tradition of surviving without division of labour. This behavior was pointed out in the introduction, with the examples by Adam Smith and the ancient Greeks. Another main finding of our research is that entrepreneurs are similar, regardless of geography, when compared to wage earners. Going back to the fictional case of the story of our two friends; – The most interesting thing happens the day you introduce Ruben and Urban. They start talking about their businesses, and get along very well. They talked about their employees, and complain about the routine problems of their providers, customers and government bureaucrats. However, they both agree on how much they like having the freedom of being their own boss. They exchange cards and comment on how many things they have in common. – And they are right; these guys have always been one of a kind.